I was a pretty dumb kid. I remember once I put orange juice in my morning cereal when we were out of milk and watched in horror as my mini-wheats swelled to 4 times their normal size and took on a taste that can only be described as gut-wrenching. 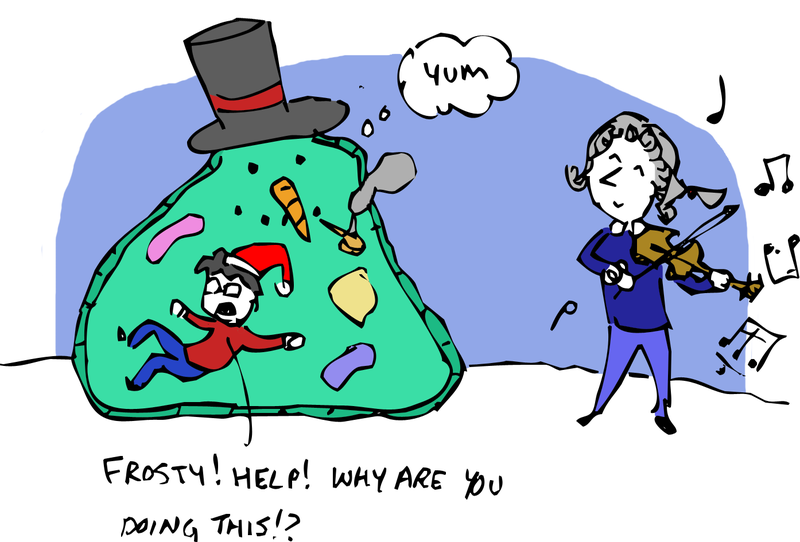 But dumb as I was there was one Christmas story that bugged be for it’s implausibility: Frosty the Snowman. You all know how it goes. 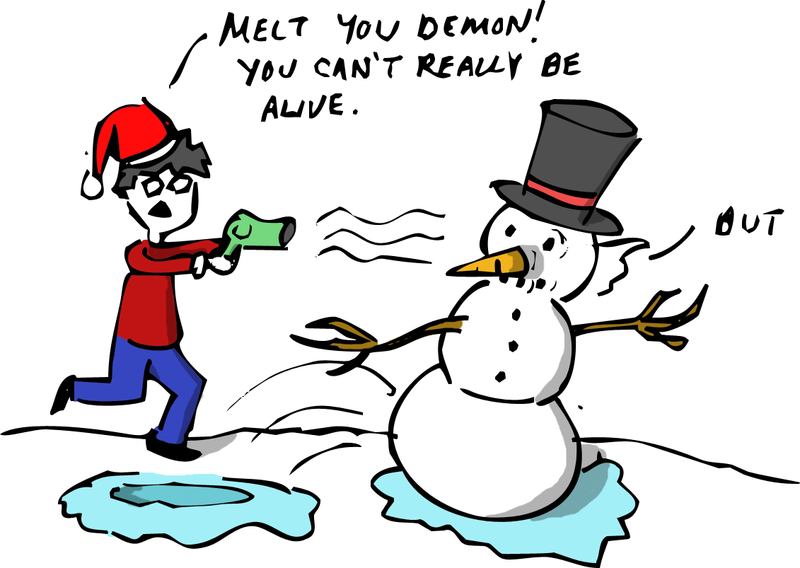 A bunch of kids make a snowman, wish him to life, and have wacky adventures all over town. Anyone who has ever made a snowman knows that the wacky adventures are in the building of the thing. If you’re expecting to build a new friend that you can melt away with a hair dryer when he gets annoying, you are in for a harsh reality check. As I’ve grown older, however, and learned about the supremely weird things that can happen in nature, I’ve begun to rethink my harsh critique. 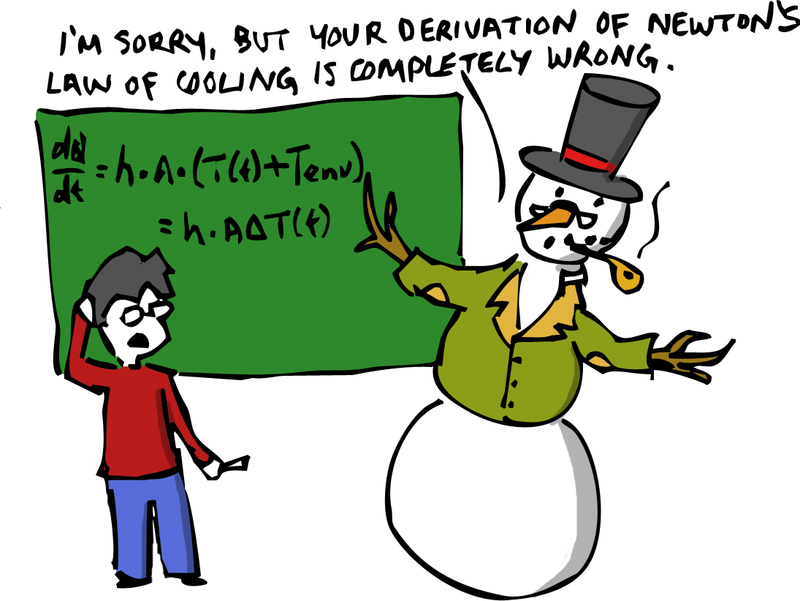 As it turns out, under just the right set of circumstances (involving tonnes of unrealistic assumptions and the invention of a whole new “maybe it could exist” species) you might just be able to create a passably intelligent snowman. Okay so here we are in a field near a forest. There is a fresh blanket of snow on the ground and we’ve set to work making our snowman. 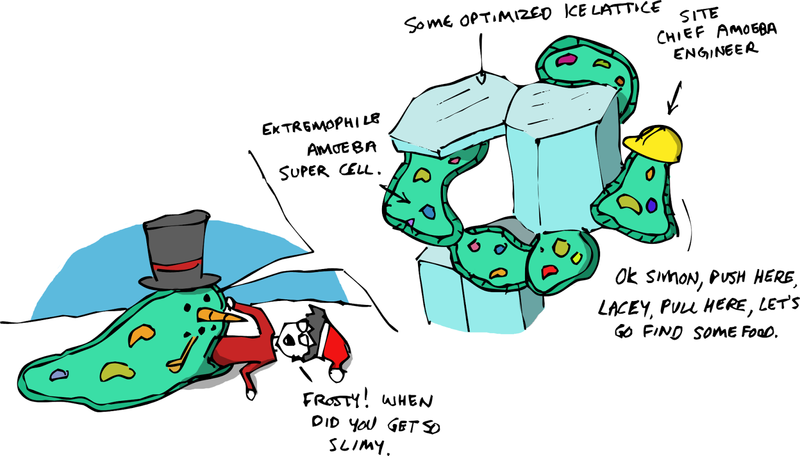 Unbeknownst to us, however, those aren’t just plain old ice crystals we’re balling up, they are loaded with amoebas! We pop in a corn cob pipe, a button nose, throw on a top hat and are amazed when our new frozen friend begins moving around the field on an apparent unspoken mission… He may not be singing or dancing but something weird is going on. Is it magic? Not quite. It turns out that some amoeba’s can play a pretty neat trick. When food is scarce or conditions are bad these single celled organisms can come together and create a sort of slug. That slug can slide around in search of food and even displays an intelligence that goes beyond what is possible for a single amoeba. Scientists call these slugs slime molds and they have shown that, when working together, amoeba colonies can solve mazes in search of food. One imaginative researcher even created an experiment where the amoebas designed a railway system for the United Kingdom that turned out to be more efficient than the one humans created. I am not making this up. 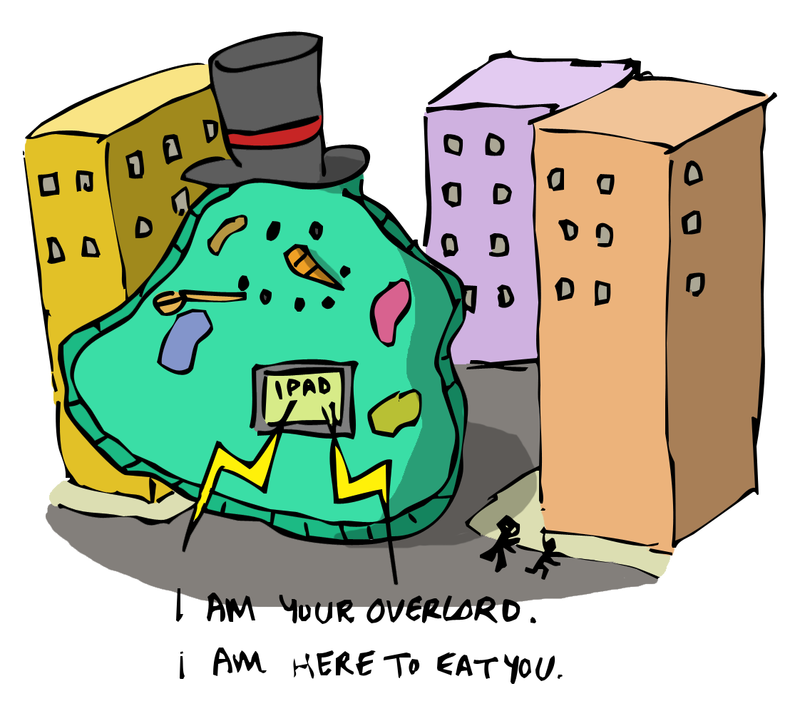 For this to even be partway plausible we need to imagine a slime mold that is also an extremophile. Extremophiles are organisms that make our assumptions about life look just plain silly. As the name suggests, extremophiles love extreme environments. They live in boiling geyser water in Yellowstone National Park and can survive and thrive at the bottom of the ocean where temperatures are incredibly low and pressures are incredibly high. It isn’t much of a stretch then to imagine a slime mold extremophile that thrives in frozen water. Maybe it could even use the structure of the crystals to strengthen the structure of the multicellular organism it forms when individual amoebas come together. Maybe when you form the snow it lives in into balls, that structure is at its strongest and becomes the perfect skeleton to do some exploring with. Unfortunately even in our wildest imagination, a talking slime mold is going a little too far. Frosty would likely be a lot less chatty and rely on sign language a lot more. 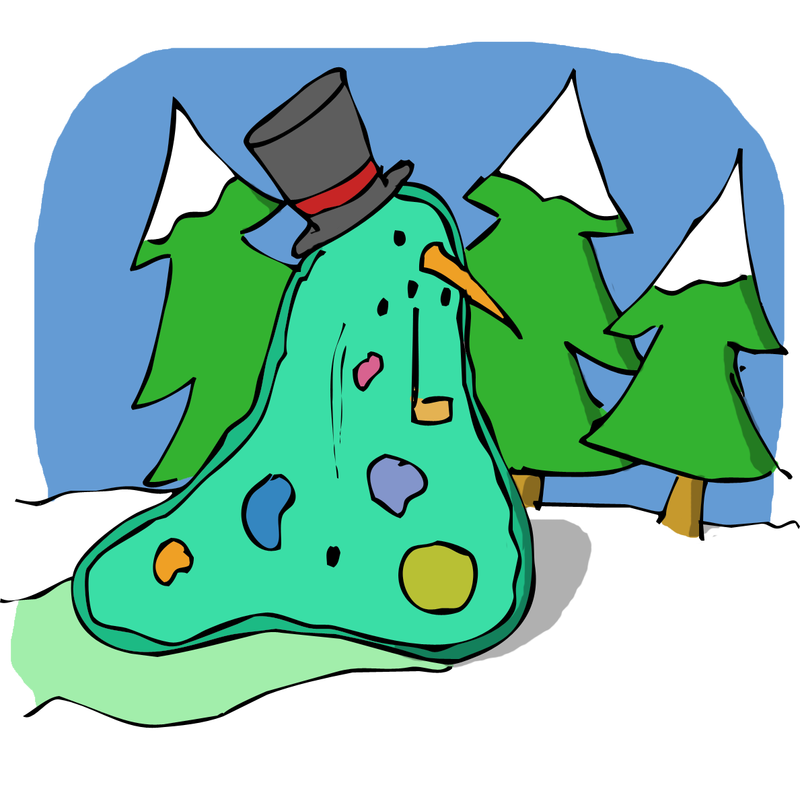 As for the singing and dancing… Well, music might actually help our amoeboid Frosty become a little more lively. Research has shown that exposing microbes to music actually improves their ability to do work. One German sewage plant actually makes a point of playing Mozart through its pipes to help bacteria break down waste faster. Christmas is a time for improbable things, and we live in an improbable world. Santa delivers presents to every house in the world. Bioluminescent Reindeer fly through the sky. Who's to say in this crazy world of giant squid and ipads that a slime mold couldn’t evolve a way to warm the cockles of your heart. Here’s to you Frosty, and all your frozen, slimey, amoeba buddies.